The Neuschwanstein Castle in Bavaria, Germany is an idyllic fairy tale castle. Not only is it a beautiful castle surrounded by the picturesque landscape of Schwangau, it’s history is fascinating. The castle was the dream of King Ludwig II. He wanted a castle like Versailles in his own backyard, a new castle Hohenschwangau (new castle = Neuschwantsein). He didn’t live long enough to complete his castle, though. He also ran out of money and incurred a large amount of debt building his different castles, including Neuschwantstein. As you walk around the extremely ornate and fantastical rooms, you may not be surprised to learn that King Ludwig II was declared “mad” in 1886, same year as his death. He was only king for 22 years (1864 – 1886). When studying abroad in Innsbruck, Austria, in the summer of 2014 as part of a law school program, I knew I had to visit Neuschwanstein, the fairy tale castle. Only a 2 hour drive from Innsbruck, it was a perfect day trip opportunity. Here’s what I learned from my last-minute decision to visit this world-famous castle. You can only view inside the castle by guided tour. The tour is only 30 minutes long because there’s only 8 rooms to see. King Ludwig II didn’t complete any more rooms. The guides are offered in German and English. If you don’t speak either of those languages (or if your prefer a tour in another language) there are audio guides available. The number of people allowed per tour is limited. Also, the number of tours offered a day is limited. So make sure you get a ticket! You can reserve tickets online at least 2 days in advance. My roommate and I decided to add Nueschwanstein to our list of things to do during our weekend stay in Innsbruck on Thursday. By that time it was too late to purchase tickets for Saturday. We had to purchase tickets in person. Do NOT do this. Trust me. You’ll save yourself a lot of time and standing if you plan ahead. We arrived around 10 AM (after taking trains and buses from Innsbruck), so the line wasn’t too long yet. But we still waited for over an hour at the Ticket Center. And now you’re thinking, “You still got done around 11 Am, so that’s not bad, right?” Not quite. And you’ll see why. The Castle is located outside the town of Hohenschwangau. You need to factor in enough time to get from the town, to the ticket center, and then to the castle itself before your scheduled tour. Since the last leg of our trip was a bus ride, we were dropped off at the outskirts of the town Füssen, along the river. We made our way to the city center and had to stop in to the tourist information center to figure out how to get to the castle. There is a bus in Füssen that takes you to Hohenschwangau. You’ll need to take the bus back into Füssen as well on your return trip if your traveling by public transport. If you’re driving, there is a parking lot in Hohenschwangua. Click here for information on how to get to the castle according to the official website. If you purchase online, you may be able to select the time you wish to tour the castle. But when you purchase at the Ticket Center, you will be given whatever tour is next available. When you purchase online, it looks like you have to redeem your tickets at a certain time before the tour will begin. Click here for a picture of how the tours are displayed at the Ticket Center. There is also a display in the large courtyard where you wait for your tour. The walk helped kill some time before our guided tour, but we still had quite a while before it was our turn. We decided to spend it walking around the exterior taking photos. Then we headed back to the lower courtyard to wait for our tour number to be displayed. 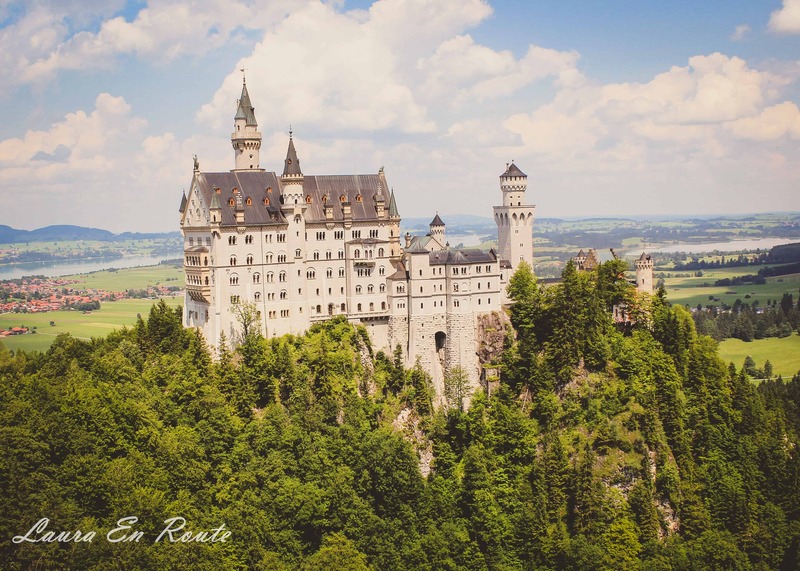 Don’t lay siege to the Neuschwanstein…photograph it! From the outside only, though. There is no photography allowed inside the castle. (I saw a lot of people break this rule…and the rule “Do Not Touch”.) So you will have to make do with photographing the facade only. But there’s plenty of opportunities to capture it from all sides. I only had time to take photos from the grounds of the castle, Marienbrüke path, and the bridge over Pöllat Gorge. However, at the end of the tour, before you reach the Souvenir Shop, there’s a small patio where you can take a photo of the lake and Hohenschwangau Castle. After your tour, roam the grounds of the castle before heading for the bridge or the shuttle bus. The path leading to the castle is lined with a few souvenir shops, too. Photo From the Marienbrücke Path. If you take the shuttle bus to or from the castle, you’ll end up on Bleckenaustraße. This street also leads to the Jugend lookout point. From this path you’ll catch a glimpse of the front of the castle. There’s a clearly marked pathway (and you can probably just follow the crowd) for the bridge. As you can see from the photo above, it’s not a very large bridge. If you’re afraid of heights or are claustrophobic, you may want to reconsider this photo-op. The best view of the castle from the bridge (seen below) is from the first half of the bridge. This means this one spot is CROWDED. And not everyone is walking across the bridge, but are only there for a photo and will be turning back around. It wasn’t fun, but it was worth it. Note: Check the Castle’s website before you visit to see if there are any road closures. As I am writing this post, access to the bridge is closed. Going back to where the bridge begins, you’ll turn left (or go straight beyond where you would turn to walk across the bridge). Continuing down the path (just follow the signs for Telberg) you’ll hike about 6 km to the top. From this trek you should be able to see the castle from a different angle. We didn’t have the time (nor were we prepared for a hike) to keep going this way. But I encourage you to keep going if you want to capture one of the most iconic views of the castle. When you’re done touring the castle and hiking around, head back down to Hohenschwangua (you can take the Shuttle). If you head towards the lake, you’ll be able to get a picture of the front of the castle. Now’s the time to use your zoom lens if you have one. To capture the castle from the air, take the Tegelbergbahn Cable Car. You can reach the cable car either in the valley or by hiking from the castle to the station on the top of Tegelberg. If you’re the adventurous type, you can hang-glide or para-sail from the top of Tegelberg. Or, if you take the cable car to the top, you can hike down to the the Neuschwanstein (I have now mastered the spelling of this castle). This castle, located in the heart of Hohenshwangua, served as King Ludwig II’s home during his youth and as his summer residence until his death in 1886. Since I was only there for the day, I didn’t have time to explore this castle. Click on the link provided above for more information. If you have time four a tour, you can purchase one ticket for the Neuschwanstein, Schloss Hohenshwangau, and the museum. If you are visiting the area for more than a day, take the time to explore the village below the Neuschwanstein. Click Ortsplan_2016 for a map of the village. Aside from the two castles, you can tour the Museum der Bayerischen Könige. It was opened to the public in 2011 and focuses on King Maximilian II, King Ludwig’s father. If you don’t have time to go in, you should at least walk around the outside. It’s a beautiful building with seating on a patio facing the lake. Take a stroll around the Alpsee Lake. When I was there, several people were having picnics, relaxing on the grass, or playing in the water with their dogs. As you can see in the photo below, you can also rent boats. The boat house offers paddle boats or rowing boats. Füssen is located along the border of Germany and Austria. If you plan your visit to the Neuschwanstein wisely, you’ll have time to visit the beautiful Bavarian town of Füssen. Füssen is where you’ll take a bus to the ticket center (if you aren’t driving). Head to the Tourist Information Center if you need a map or ideas of what to see and do or where to eat. Outside is an amazing fountain feature. The squares rotate! It was mesmerizing. The main street in Old Town is Reichenstrasse. The building facades are enough reason to stroll down this beautiful street laden with cafes and shops. Beyond restaurants and shopping, there is plenty to do and see in Füssen. If you want to enjoy Old Town, check out the mobile phone tour offered by the city. The town has its own castle, Hohes Schloss (High Castle), which houses a painting and sculpture gallery. The Castle is located on a hilltop near the river Lech. Below the castle is the former Abbey of St Mang, now the home to the Füssen Museum, displaying the history of the town’s violin-making days. Across from the museums is the Spitalkirch Heilig Geist, a beautifully painted church. Next time I’m in Germany, I’d love to revisit Füssen and Neuschwantsein, preferably in the fall or winter. Have you been to the Fairy Tale Castle? Share your favorite tips for seeing Neuschwanstein and the surrounding towns in the comments below!